Problematic flying-fox camps will be easier to manage with the release of draft camp management guidelines for the Grey-headed and Spectacled flying-fox. These guidelines provide methods the community can use to disperse flying-fox colonies, where there are concerns for public health, in a way that does not impact upon the species. Flying-foxes play an important ecological role as pollinators and dispersers of native plant seeds, but when they gather in large groups they can cause noise, smell and health concerns for nearby residents. These guidelines describe options for low-cost and low-risk methods to disperse flying-fox populations, such as tree-trimming or boundary clearing. Communities will be able to undertake these activities without requiring approval from the Australian Government. Importantly, the guidelines do not allow for lethal actions such as culling. The Grey-headed flying-fox can be found widely across Queensland, NSW, ACT, Victoria and South Australia in search of food. The Spectacled flying-fox ranges across Far North Queensland. This means that national coordination is very important for managing the camps of these highly mobile species. The policy has been developed through consultation with flying-fox experts and state and territory government agencies. It also draws on an improved understanding of flying-fox numbers and movements gained through the National Flying-fox Monitoring Programme. Minister for Primary Industries, Katrina Hodgkinson, and Minister for the Environment, Rob Stokes, have announced a decision on the future of line fishing from ocean beaches and headlands at 30 mainland marine park sanctuary sites in NSW. • immediately remove the amnesty at 20 sites, where sanctuary zone rules will again be enforced. Ms Hodgkinson said the changes are consistent with the NSW Government’s new approach to management of the marine estate. 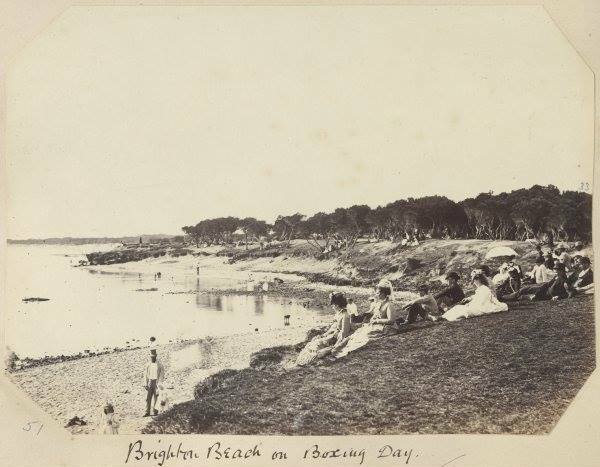 “The amnesty to allow shore-based recreational line fishing from 30 ocean beaches and headlands in marine park sanctuary zones was put in place in 2013 in response to the findings of the independent scientific audit of NSW marine parks,” Ms Hodgkinson said. “The audit found that information was lacking with respect to some no-take zones, including ocean beaches. “The amnesty was announced as a temporary measure, while a thorough risk assessment of the impact of these activities was undertaken. “That assessment, completed by the independent Marine Estate Expert Knowledge Panel, found that recreational shore-based line fishing was a low-risk activity at 10 locations, which will be rezoned to permanently allow this activity. “The panel’s findings have informed the NSW Government’s decision to retain the amnesty at 10 sites and lift it at 20 sites. Mr Stokes said that enforcement of sanctuary zone provisions at the 20 sites will recommence immediately. “These areas will return to a more natural state to be enjoyed for activities such as snorkelling and diving, as well as being used for scientific reference sites and educational purposes,” he said. “A six-month advisory period will accompany the lifting of the amnesty; during this period recreational fishers found to be in breach of the rules will receive a caution however repeat offenders will be subject to standard compliance action. Mr Stokes said there remained information gaps in relation to the impacts of this type of fishing in marine waters. “To help fill these, the NSW Government will implement an enhanced data collection program so that fishing pressure and ecological condition can be more readily compared,” he said. “This additional science is vital to inform future management decisions, including the development of the Marine Estate Management Strategy and forthcoming marine park planning pilots,” Mr Stokes said. Further consideration of economic, social and ecological values will occur in each of the areas as part of planned reviews of management arrangements in each marine park. Further information, including advice to the NSW Government from the Marine Estate Expert Knowledge Panel and the Marine Estate Management Authority, can be found at www.marine.nsw.gov.au. The Department of Primary Industries (DPI) is seeking assistance from the public to help stop the spread of Tilapia, one of the world's most invasive fish species, after they were recently detected in the far north east of the State. DPI Strategy Leader Aquatic Biosecurity Melissa Walker said community assistance is urgently needed to control the spread these pest fish, which were recently found in Bogangar Canal and Cudgen Lake, south of Kingscliff. "The highest risk for transporting Tilapia is via humans carrying live fish or eggs," Ms Walker said. "If people catch or find a Tilapia, it is vital that the fish is not returned to the water. "Our advice to anyone who catches or finds Tilapia is to humanely destroy and dispose of it appropriately. "In any case of uncertainty about identification, we recommend taking a good quality photo then calling the Aquatic Pest Hotline immediately for confirmation." Ms Walker said Tilapia have pale olive to silver-grey bodies, with a long continuous dorsal fin, and can grow to more than 36 centimetres and live up to 13 years. "The fish are particularly threatening because they are such successful breeders," Ms Walker said. "Mothers produce up to 1200 eggs a year and protect their young fry in their mouths for up to 14 days before releasing them. "This technique, known as 'mouth brooding', ensures that even if the mother is not living, any eggs in the mouth have the potential to survive. "Once established in a flowing river or creek, these fish are almost impossible to eradicate so it is important to stop the spread of tilapia now before it's too late." 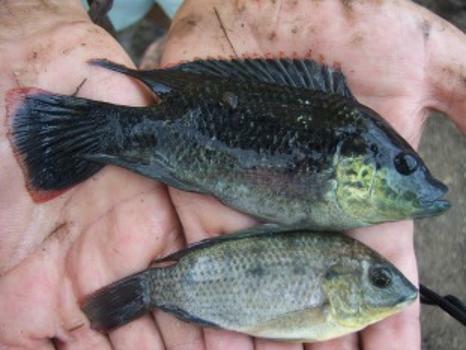 Tilapia impact on native fish numbers by competing for habitat and food, behaving aggressively, disturbing aquatic vegetation and could potentially introduce disease and parasites. DPI Fisheries and Biosecurity staff are working with local council to coordinate surveys of the surrounding areas to help inform potential management options for this invasive pest fish. The Australian and New South Wales Governments has released for public comment an updated bilateral agreement on environmental assessments under national environment law. The Australian Government is working with state and territory governments to streamline environmental regulation and develop a 'One-Stop Shop' for environmental assessment and approvals. Federal Environment Minister Greg Hunt said that this new enhanced agreement will replace the assessment bilateral agreement currently in place and would deliver a more efficient process and greater certainty for business while maintaining the highest standards of environmental protection. "This revised agreement builds upon the streamlining benefits of the current agreement, and introduces additional efficiency measures for environmental regulation in New South Wales. "It is concrete evidence that our governments are progressively delivering on our shared objective to provide efficient, thorough and transparent environmental regulation in NSW while minimising duplication. "Under this agreement, NSW will be accredited to conduct a project assessment under national laws and provide the Australian Government with a recommendation on whether to approve a project and what conditions should be attached to that decision under federal environment law," said Minister Hunt. NSW Minister for Planning, Pru Goward, said that New South Wales will provide the Australian Government with rigorous and robust advice under national environment law. "This will include jointly seeking expert advice from the Independent Expert Scientific Committee on Coal Seam Gas and Large Coal Mining Development for projects that are likely to have a significant impact on a water resource. "Importantly, opportunities and timelines for the community to have a say about major developments are not proposed to change. This is about reducing needless hold-ups caused by two governments passing projects back and forth between them while they are being assessed. "It means that projects in NSW will go through a single, NSW process, to ensure that high environmental standards are maintained." A strong assurance framework ensures the best possible environmental protections remain in place including routine reporting, evaluation and review provisions, transparency and information sharing commitments and oversight of the agreement through a senior officers' committee. Minister Goward said, “This new agreement reflects New South Wale’s determination to maximise the efficiency of the environmental assessment and approval process, and include a broader scope to ensure that more projects benefit from streamlined assessment. "This agreement also recognises New South Wales' rigorous and transparent approach to determining offset requirements under its newly finalised NSW Biodiversity Offsets Policy for Major Projects." The Australian Government remains committed to entering into approval bilateral agreements with all State and Territory Governments. Approval bilateral agreements will ensure that only one decision is required for environmental approvals, accounting for both State matters and matters of national environmental significance. This will further reduce the duplication of Federal and State planning processes which adds complexity, costs and delays to environmental approvals across the country. NSW Minister for Primary Industries, Katrina Hodgkinson, and Minister for the Environment, Rob Stokes, today announced the commencement of a study to assess the greater Sydney marine region. The study will involve a comprehensive assessment of the Hawkesbury Shelf bioregion, which extends from Newcastle to Wollongong and includes Sydney Harbour, Broken Bay, Botany Bay and Port Hacking. Ms Hodgkinson said the assessment will be conducted in accordance with the NSW Government’s new approach for marine estate management, as recently demonstrated with the passage of the Marine Estate Management Bill 2014 through NSW Parliament. “It is important we continue to work to achieve a balance of social, economic and ecological needs when considering our marine estate,” Ms Hodgkinson said. “Our approach is about committing to an evidence-based decision making process when it comes to the management of the marine estate, which considers social, economic and ecological impacts. “There is no doubt that Sydney Harbour is an iconic and special place, but it is also a functional and working harbour. Mr Stokes said monitoring and research at these priority sites will inform decision making about the creation of an integrated marine protected area along the metro coast by 2016. “The NSW Government supports well located marine protected areas that improve marine biodiversity, enhance fish stocks and provide great recreational opportunities,” Mr Stokes said. “This research will enable decisions about enhanced and integrated marine protection along the entire Hawkesbury Shelf Bioregion, including Sydney's harbour, estuaries and the metro coastline. Mr Stokes also announced that a report prepared for the NSW Government which collates existing information on the ecological assets, threats, and economic and social values of Sydney Harbour will provide background information into the study. “The report by the Sydney Institute of Marine Science provides a good grounding for the Hawkesbury Shelf bioregion study to begin,” Mr Stokes said. Further information can be found at www.marine.nsw.gov.au. Australian authors, poets and historians are invited to enter the 2015 Prime Minister’s Literary Awards. The Prime Minister’s Literary Awards celebrate the contribution of Australian literature to our cultural and intellectual life. These awards recognise the role Australian writers play in enlightening and entertaining us, reflecting on our history, and taking our stories to the world. They acknowledge excellence in Australian fiction, poetry, non-fiction, young adult fiction and children’s fiction, and in Australian history. A total prize pool of $600,000 is available to winners and shortlisted authors in these six categories. The 2015 awards are now open for books first published in English and made available for general sale in Australia between 1 January 2014 and 31 December 2014. Entries close at 5.00pm (AEDT) on Saturday 28 February 2015. Entry forms and eligibility guidelines are available on the Ministry for the Arts website. The ICC Cricket World Cup 2015 is coming to Australia and New Zealand in February and March 2015. Guidelines released today support the conservation of threatened koala populations in Queensland, New South Wales and the ACT by identifying habitat critical to their survival. This iconic animal is much loved in the community and these guidelines will contribute to its survival in the wild in the long term. The guidelines help to ensure that developments in the range of the koala avoid significant impacts on it and its habitat. By promoting good practice early in the decision-making process, the guidelines provide more certainty for affected industries, and for koala conservation. In highly developed urban areas the koala faces ongoing threats from dog attacks and vehicle strike, but in more natural areas there are fewer threats to their survival. These guidelines promote the protection of large, linked up areas of bushland where koalas have a good chance of surviving in the long term. As well as outlining how to avoid significant impacts, the guidelines include standards for mitigation measures, such as underpasses or land bridges across highways, which can reduce the impact of new infrastructure on koala habitat. The guidelines are based on the best available science, as well as significant community and industry input. Our conservation work on the koala continues with a National Recovery Plan for the koala now under development, in consultation with State and Territory agencies and key stakeholders. The koala occurs from north-east, tropical Queensland to the south-east corner of South Australia and Kangaroo Island. It is widespread, but patchy, throughout this range and it extends into semi-arid regions west of the Great Dividing Range. The combined koala populations of Queensland, NSW and the ACT were listed as Vulnerable under the national environment law in May 2012 due to population decline throughout this range. NSW Deputy Premier Troy Grant and Environment Minister Rob Stokes today welcomed the independent expert panel report on the review of native vegetation and threatened species laws. Mr Grant said the independent panel’s recommendations included replacing the Native Vegetation Act, Threatened Species Act and parts of the National Parks and Wildlife Act with a new single piece of legislation that will ensure a balanced approach is taken in managing biodiversity, using a triple bottom line approach. “The NSW Government is yet to form a response to the review but it’s pretty clear that based on this independent review, the Native Vegetation Act should be abolished,” Mr Grant said. “I am confident the independent review’s findings will help us chart a path forward. “For too long, farmers have been treated differently to all other landholders in the State and have faced many regulatory burdens in managing their land. “Farmers are some of the best possible custodians of our land as they have a direct interest in ensuring biodiversity is sustained into the future. Mr Stokes welcomed the panel’s recommendations and a proposal to draft a new, integrated Biodiversity Conservation Act. “The proposals set out in the report will modernise and simplify a fragmented and aging set of biodiversity laws that have never been comprehensively reviewed,” Mr Stokes said. “The proposals in this report offer a once-in-a-generation opportunity to implement transformational reforms and put in place a new law that will drive positive biodiversity conservation outcomes in NSW. “I particularly acknowledge the recommendations that the Government must consider significant additional investment in private land conservation and our threatened species programs. “The panel has made it clear that their recommendations should be implemented as an integrated package of reforms. This is necessary to ensure that we achieve our dual objectives to facilitate ecologically sustainable development and to conserve our environment.”The NSW Government will now consider the report and provide a response before the 2015 election. The NSW Office of Environment and Heritage (OEH) and local community members are concerned about recent reports of Superb Parrots being killed by vehicles on roads in the Boorowa and Young Shires. The birds were apparently feeding on spilled grain. Grain spillage from trucks is one of the main threats facing the Superb Parrot, a threatened birds. About 15 years ago, a statewide campaign commenced to increase awareness of the issue. This included providing signage at grain silos and weighbridges throughout the NSW wheatbelt where Superb Parrots are known to occur. This initiative was well supported by local grain growers and GrainCorp and most grain trucks now cover their loads, which has reduced roadkill of Superb Parrots and other birds that feed on spilled grain. OEH Threatened Species Team Leader Damon Oliver said he had recently received two reports of dead Superb Parrots at Monteagle and Bendick Murrell. The reports came from members of a community-based Superb Parrot survey program. Dr Oliver also recently saw a dead female Superb Parrot on a road near Murringo. The reports of dead Superb Parrots appear to be connected with grain trucks travelling along country roads in the Boorowa and Young areas. “The birds land to feed and they fill up on grain. Birds are weighed down and have little chance of avoiding being hit by vehicles traveling at high speed,” Dr Oliver said. “Unfortunately, Superb Parrots do not have the same road sense as Crows and other birds that often feed on roads and road verges. 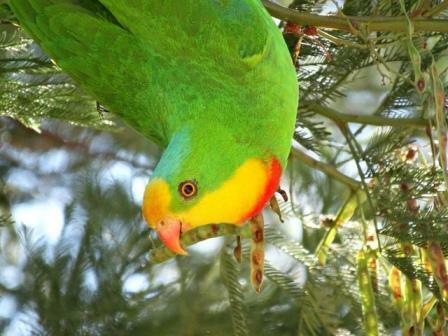 Dr Oliver said many farmers in the NSW wheatbelt were aware of the Superb Parrot. He said some were protecting paddock trees and other vegetation the birds used for breeding habitat. “It is very clear that the community cares for the Superb Parrot and is concerned to see birds getting hit on country roads. “If you see a flock of Superb Parrots along a country road please slow down and consider sounding your horn when approaching. December 17, 2014 – A network of nine reference sites off the Australian coast is providing the latest physical, chemical, and biological information to help scientists better understand Australia's coastal seas, according to a study published December 17, 2014 in the open-access journal PLOS ONE by Tim Lynch from CSIRO, Australia and colleagues. Sustained oceanic observations allow scientists to track changes in oceanography and ecosystems. To address this, the Australian Integrated Marine Observing System (IMOS) implemented a network of nine National Reference Stations (NRS). The network builds on three long-term locations, where monthly water sampling has been ongoing since the 1940s and 50s. These moored sensors now collect more than 50 data streams, including sampling for temperature, salinity and nutrients, carbon, currents, and both phytoplankton and zooplankton. The authors of this study evaluated the utility of this network and found that it may aid in observation of extreme events, such as marine heat waves, rare events, such as plankton blooms, and allow for consistent large scale sampling and analysis of coastal zooplankton and phytoplankton communities. The NRS may provide scientists with an understanding of how large-scale, long-term change and variability in the global ocean are affecting Australia's coastal seas and ecosystems. Lead author, Dr Tim Lynch from CSIRO's Oceans and Atmosphere Flagship, says, "For the first time in Australia, we have combined forces across our various marine institutes and research organisations to build a continent-wide sampling of our coastal seas and ecosystems, so we can continuously track and understand variation at daily, seasonal, and annual time scales." Amazing CCTV footage - What this elephant does will blow your mind, if they can do it why cant we? Written submissions to the independent review of Commonwealth Marine Reserves open today. The co-Chairs of the Bioregional Advisory Panels, Professor Colin Buxton and Mr Peter Cochrane invite interested parties to provide them with ideas and suggestions on how marine reserves should be managed into the future. “We are really keen to hear from a broad range of stakeholders and are hoping those with an interest will complete a simple online survey or provide a more detailed submission,” Professor Colin Buxton said. The Review is focused on making sure that its work builds on the feedback and efforts that individuals and organisations have already made. The Review has established five Bioregional Advisory Panels (representing the South-west, North-west, North, Temperate East and Coral Sea marine regions) to facilitate consultation with interested parties. Details about making a submission can be found on the Join the Conversation page at www.marinereservesreview.gov.au. The online survey is expected to be available soon. The submission period will remain open until 28 February 2015. “We’d encourage everyone to get in early as this will help focus our efforts over the coming months,” Mr Peter Cochrane said. The terms of reference can be found on the review websitewww.marinereservesreview.gov.au . On 26 December 2004, a magnitude nine earthquake off northern Sumatra triggered one of the worst natural disasters in modern times. The tsunamis that swept across the Indian Ocean caused massive loss of life and utter devastation. More than 200,000 people died and over a million were left injured or homeless. The thoughts and prayers of all Australians were with the people of our region that day, as news of the horrific events flashed around the world. This 10th anniversary is a time to commemorate the lives that were lost. This is also an opportunity to pay tribute to all that were involved in the search, rescue and rebuilding efforts. Ten years on, we remember that the worst of times can bring out the best in people, and that the bonds of friendship between the countries of the Indo-Pacific have never been stronger. December 23, 2014 - While searching for the origin of our brain, biologists at Heidelberg University have gained new insights into the evolution of the central nervous system (CNS) and its highly developed biological structures. The researchers analysed neurogenesis at the molecular level in the model organism Nematostella vectensis. Using certain genes and signal factors, the team led by Prof. Dr. Thomas Holstein of the Centre for Organismal Studies demonstrated how the origin of nerve cell centralization can be traced back to the diffuse nerve net of simple and original lower animals like the sea anemone. The results of their research will be published in the journal "Nature Communications." Like corals and jellyfish, the sea anemone -- Nematostella vectensis -- is a member of the Cnidaria family, which is over 700 million years old. It has a simple sack-like body, with no skeleton and just one body orifice. The nervous system of this original multicellular animal is organised in an elementary nerve net that is already capable of simple behaviour patterns. Researchers previously assumed that this net did not evidence centralization, that is, no local concentration of nerve cells. In the course of their research, however, the scientists discovered that the nerve net of the embryonic sea anemone is formed by a set of neuronal genes and signal factors that are also found in vertebrates. According to Prof. Holstein, the origin of the first nerve cells depends on the Wnt signal pathway, named for its signal protein, Wnt. It plays a pivotal role in the orderly evolution of different types of animal cells. The Heidelberg researchers also uncovered an initial indication that another signal path is active in the neurogenesis of sea anemones -- the BMP pathway, which is instrumental for the centralization of nerve cells in vertebrates. Named after the BMP signal protein, this pathway controls the evolution of various cell types depending on the protein concentration, similar to the Wnt pathway, but in a different direction. The BMP pathway runs at a right angle to the Wnt pathway, thereby creating an asymmetrical pattern of neuronal cell types in the widely diffuse neuronal net of the sea anemone. "This can be considered as the birth of centralization of the neuronal network on the path to the complex brains of vertebrates," underscores Prof. Holstein. While the Wnt signal path triggers the formation of the primary body axis of all animals, from sponges to vertebrates, the BMP signal pathway is also involved in the formation of the secondary body axis (back and abdomen) in advanced vertebrates. "Our research results indicate that the origin of a central nervous system is closely linked to the evolution of the body axes," explains Prof. Holstein. GoPro edit from Harley Ingleby's May 2014 run up to the Telo Island Lodge. In 1951, Marilyn Monroe’s film studio wanted to prove that she would look good even in a Potato Sack Dress. This was the result. Manly Malarki open womens surfboat. Video of a newly discovered species is now the world’s deepest known fish recorded at 8,143 m depth. The fish has a novel body form that has not been seen before. It stunned scientists because in other trenches, there is only one fish species at this depth--a snailfish; this fish is really different from any other deep-sea fish that scientists have ever seen. The Mariana Trench -- located in the Western Pacific near Guam -- has been the focus of high-profile voyages to conquer Challenger Deep, the deepest place on Earth. This recent expedition to the Trench onboard Research Vessel Falkor targeted multiple depths and found active thriving communities of animals. The expedition set many new records, including the deepest rock samples ever collected and the discovery of new fish species at the greatest depths ever recorded. December 22, 2014 - Paleontologists have documented the evolutionary adaptations necessary for ancient lobe-finned fish to transform pectoral fins used underwater into strong, bony structures, such as those of Tiktaalik roseae. This enabled these emerging tetrapods, animals with limbs, to crawl in shallow water or on land. But evolutionary biologists have wondered why the modern structure called the autopod - comprising wrists and fingers or ankles and toes - has no obvious morphological counterpart in the fins of living fishes. The primary genes that shape the bones, known as the HoxD and HoxA clusters, also differ. The researchers first tested the ability of genetic "switches" that control HoxD and HoxA genes from teleosts--bony, ray-finned fish--to shape the limbs of developing transgenic mice. The fish control switches, however, did not trigger any activity in the autopod. Teleost fish -a vast group that includes almost all of the world's important sport and commercial fish -are widely studied. But the researchers began to realize they were not the ideal comparison for studies of how ancient genes were regulated. When they searched for wrist and digit-building genetic switches, they found "a lack of sequence conservation" in teleost species. They traced the problem to a radical change in the genetics of teleost fish. More than 300 million years ago, after the fish-like creatures that would become tetrapods split off from other bony fish, a common ancestor of the teleost lineage went through a whole-genome duplication (WGD)--a phenomenon that has occurred multiple times in evolution. Did you know the Australian Dictionary of Biography hold their regular meetings at the State Library of NSW? 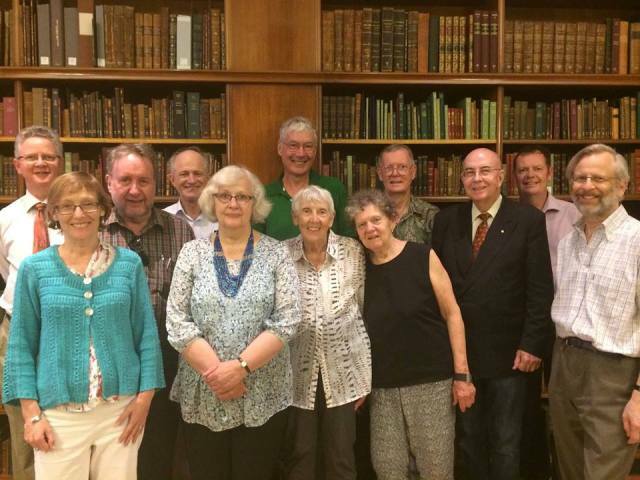 Here are the members attending the most recent meeting in our beautiful Sir William Dixson Research Library. (l to r) Alex Byrne, Nancy Cushing, Andrew Moore, Chris Cunneen, Elizabeth Ellis, Alan Ventress, Jill Roe, Jack Carmody, Bev Kingsston, John McLaughlin, Andy Carr and Murray Goot.